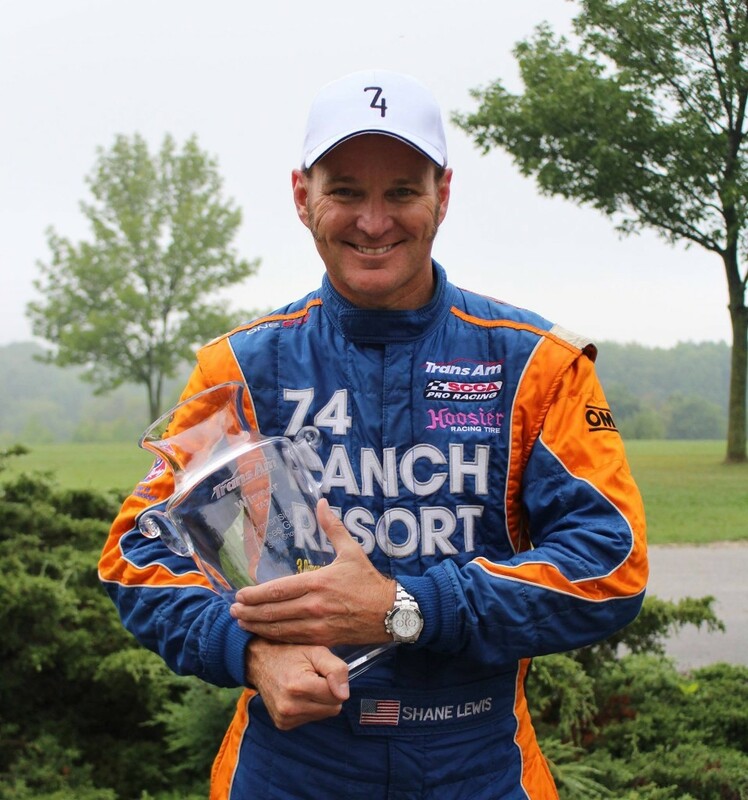 September 1, 2015 – Jupiter, Florida – After a thrilling one-two finish at Mid-Ohio Sports Car Course earlier in August, Shane Lewis and the Robinson Racing team arrived at Elkhart Lake, Wisconsin last week, for Round 8 of the Trans Am Series, radiating with confidence. America’s National Park of Speed, Road America promised to be an intense challenge, especially at a circuit evoking such a storied 60-year history in motorsports. Fast Five Qualifying for the Pony Wars began at 8:45 am on Friday, at which time both Lewis and Robinson driving the twin 74 Ranch Resort Camaros once again found their stride around the 14-turn, 4.048-mile circuit qualifying in the Top 5 of the TA2 Class. Robinson secured the second spot while Lewis came in fifth. Saturday morning’s race day came and was marred with widespread fog, chilly temperatures, a persistent drizzle and a damp track from the previous night’s rain storms. Despite these inopportune conditions, road racing fans were ready for the show and the green flag dropped promptly at 9:30 am CT for the Next Dimension 100 presented by 3-Dimensional Services Group, which included a 63-car field in the TA, TA2 and TA3 Classes. With three full course cautions and multiple collisions, the mission for most was to just survive relatively intact and hopefully add a few points toward the championship. Lewis began the race in fifth, falling back to ninth but avoiding the oil down and cars going off track. The “comeback kid” then powered through the obstacles and charged up to fourth; the last yellow flag fell just minutes before the checkered flag. With Lewis’ fourth place finish at Road America, he emerged as the winner of the 3-Dimensional Services Group Triple Shot Showdown in the TA2 Class. Celebrating Trans Am racing at three historic tracks, the Triple Shot Showdown trophy was awarded to the driver scoring the most points per class at Lime Rock Park, Mid-Ohio Sports Car Course and Road America. His results at the three diverse tracks totaled 72 points which earned him the top spot and the title. Known for humor and style, Lewis celebrated the Triple Shot Showdown win by filling the trophy with root beer and vanilla ice cream and enjoying a giant root beer float. The Next Dimension 100 at Road America will air on the CBS Sports Network on September 12, 2015 at 10:00 am ET. On September 5, 2015 at 10:00 am ET, CBS Sports Network will broadcast the TA2 race held at Mid-Ohio Sports Car Course. After 8 rounds of the 2015 Chase for the Trigon Trophy, presented by 3-Dimensional Services Group, Shane Lewis moved up from fifth to fourth in the standings with 174 points, just one point behind third. The next race, Round 9 of the Trans Am Championship, will be held at Virginia International Raceway, on Sunday, September 27, 2015, at 12:50 pm ET. For more information and to view images from the Road America race, visit www.GoTransAm.com.